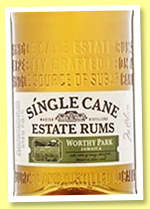 Worthy Park ‘Single Cane Estate Rum’ (40%, Bacardi, Jamaica, 1l, +/-2016) Some kind of ‘independent’ bottling of Worthy Park done by Bacardi for travel retail. Ah, travel retail, two words that always scare me. Now ‘Worthy Park’ sounds great, so… Colour: golden amber. Some caramel’s been used, most probably, since this cannot be really old at approx 30€ a bottle (and naturally, 35€ in travel retail). Nose: some typical tarry, garage-y, and pretty brine-y smells over notes of burnt caramel and butterscotch. Much gentler than the ‘usual’ Worthy Parks, but it’s still Worthy Park. Ish. Mouth: rather weird, with indeed this usual tarry and medicinal profile, but also quite some notes of toasted oak, more bitter caramel, and a relatively discreet sweetness that shouldn’t quite be there IMHO. Feels a little tampered with. It’s as if some oak chips have been in use, and some saccharine too. Finish: rather short for Worthy Park. Even at 40% vol., it should be rather longer. Comments: it’s rather okay, but it misses Worthy Park’s point, IMHO. 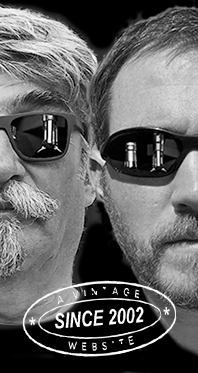 Were I the owner of some very well-reputed own-estate rum distillery, I wouldn’t let some large brands use my name. Or only ‘Jamaica’, at a pinch. Or keep control of the whole process, till bottling. SGP:452 - 74 points. South Pacific Distillers 2009/2017 (57.18%, La Maison du Whisky, Transcontinental Rum Line, Fiji) A vatting of four casks essentially matured in Europe, and a distillate that’s already rather impressed me in the past. Colour: white wine. Nose: burnt tyres, UHU glue, nail polish remover, rotting bananas, diesel oil, new rubber boots, acetone, kerosene… I like that! With water: more of all that, while it gets even brinier. Yes that was possible. Mouth (neat): acrid and even aggressive, with more rotting oranges, honey vinegar, lemon and lime juices, gherkin brine, and that edible glue that we used to eat at school. We had one that was called ‘Cléopâtre’. And yes I like that. With water: pickled fruits, glue-y chutneys, more kerosene, and a growing saltiness. Forgot to mention olives, and green bananas. Finish: very long, salty, smoky, petroly, tarry, varnishy. Comments: it’s furiously Jamaican, this little Fijian rum! Love it – and it’ll make your guests laugh (and wonder if you didn’t go mad). SGP:463 - 88 points. Jamaican Rum 14 yo 2002/2017 (46%, Cadenhead, Green Label, barrel) Colour: straw. Nose: indeed, Jamaican, that is to say brine-y, olive-y, slightly tarry, partly burnt, with some rotting bananas yet again, whiffs of nail polish, and some cane juice. No monster this time, let’s call it a gentler typical Jamaican. Sometimes you need peace… Mouth: very good, perhaps a tad earthier than other petroly Jamaicans, and perhaps a notch sweeter/rounder as well. Banana cake sprinkled with liquorice liqueur and seawater. But who would do that? Finish: rather long, rather salty, and beautifully cane-y. Tarry aftertaste. Comments: bang for your buck Jamaican. If you’re a whisky drinker and never tried any proper Jamaican rum, this may be for you. SGP:453 - 87 points. New Yarmouth 12 yo 2005/2017 (55%, Compagnie des Indes, Jamaica, cask #JNY17, 319 bottles) A new name to me! As I understand it, but I may well be wrong, New Yarmouth is the name of the sugar estate that shelters Clarendon/Monymusk distillery. Which suggests that this might actually be Monymusk. Not too sure, I’m no rum expert… Colour: white wine. Nose: smoked cardboard! Very different from the brinier Worthy Park or Hampden, rather sootier, partly mouldy, with whiffs of old clothes and of that old petrol can in a corner of the garage. With water: old black olives and wood varnish, plus old machine grease. Mouth (neat): extreme and strange. Bitter, with notes of smoked artichokes (should anyone ever try to do that), but also fruity, with of unexpected notes some strawberry jam and crushed bananas. There’s quite some varnish too. With water: gets rather acetic, while the strawberries are still sitting there. Strawberry vinegar, does that exist? I know of raspberry vinegar… Finish: long, on black tapenade and cardboard. Notes of mezcal in the aftertaste. 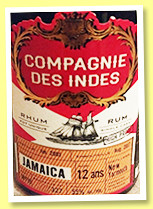 Comments: that’s what’s great with Compagnie des Indes, I don’t think I’ve ever come across a boring rum of theirs. SGP:462 - 84 points. Paranubes Rum (54%, OB, Mexico, 2017) That’s right, some rum from Oaxaca, Mexico, where they usually make all those great mezcals. What’s more, this is meant to be agricole-style rum, so made out of sugarcane juice instead of molasses. Let’s see what happens… Colour: white. So, unaged, or aged in inert containers. Nose: oh the purity of this! Of course you cannot not think of mezcal, and indeed we’re approaching those famous clairins/klérins from Haiti. This is right up my alley, totally distillate-driven (not kiddin’, S.?) and perfectly vegetable-y, with asparagus, capers, olives, and indeed sugarcane juice. A discreet smokiness in the background (burning seaweed on a beach). So far, so good… With water: gets more petroly, more acrid, and more on capers. Pickled onions, perhaps… Mouth (neat): hurray, a new flavour! It’s not easy to describe, perhaps fermenting bananas plus mango jam? There is some sweetness, and even a little sugar, in fact… Honey? The rest is perfectly herbal and grassy, with touches of green beans and indeed, asparagus. Dare I add ‘agave’? With water: excellent! What a lovely spirit, with this immaculate dirtiness (right, S.), this earth, olives, sweet nuts, grapefruits… Finish: long, rather on salted bananas covered with tar liqueur. Comments: I’m a fan. We’ve also known artisanal cachaças that were a bit like this. SGP:562 - 88 points. Very happy with this wee session, I have to say!